Braun is one of the most reliable brands when it comes to electric shavers. No wonder, German electronics have always had a good reputation and the Braun Series 7 790cc promises to last for seven years, which is relatively long for a shaver. The Braun Pulsonic is an elegant foil-style shaver featuring a metallic grey color. The shaver comes in a kit with a black charging and cleaning station. 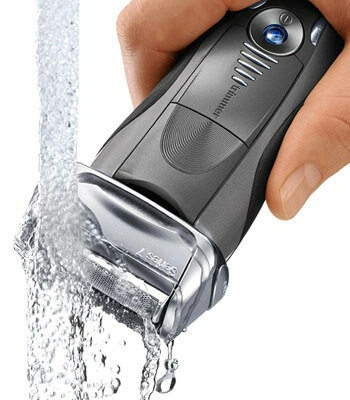 The Braun Pulsonic shaver is not only popular because of its looks, but because it was called the “world’s number one shaver brand” by a leading market research institute. 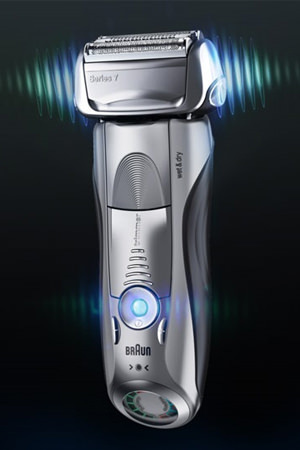 The Braun Series 7 – 790 cc Pulsonic is a premium category shaver which means that it is in a higher price range. However, if you are looking for a premium shaver which will stay with you for a long time and provide you with an exceptional shaving experience, then it’s definitely worth investing in it. The 790cc is the best in the Pulsonic line, packed with more features than the 390cc or the 590cc. This Braun shaver also differs from the 720s line as it has the Clean and Renew system which helps you with maintenance, thus promising a longer life for your shaver. The Braun Pulsonic foil shaver is designed to work with sideways movements to the skin which differentiates it from rotary-style shavers which work with circular movements. This is really just a matter of preference, some like the rotary-style while others prefer the foil-head shaver. The Braun Series 7 – 790cc has an ergonomic design which results in a smooth grip. This shaver will most likely fit nicely in your hand which is the first step to a comfortable shaving experience. There are two sections of black rubber on the sides of the shaver to enable a more secure grip. 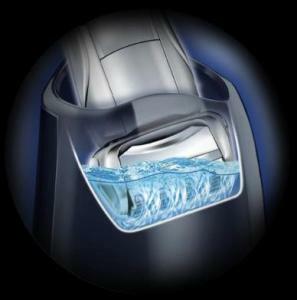 This feature will help you to keep hold of the shaver, even if you’re shaving with water, soap, shaving gels or creams. The foil-style shaver sits above the base. 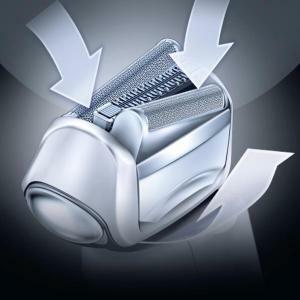 This allows it to pivot and flex independently from the shaver body. On the lower third of the shaver, there is a blue circular button. 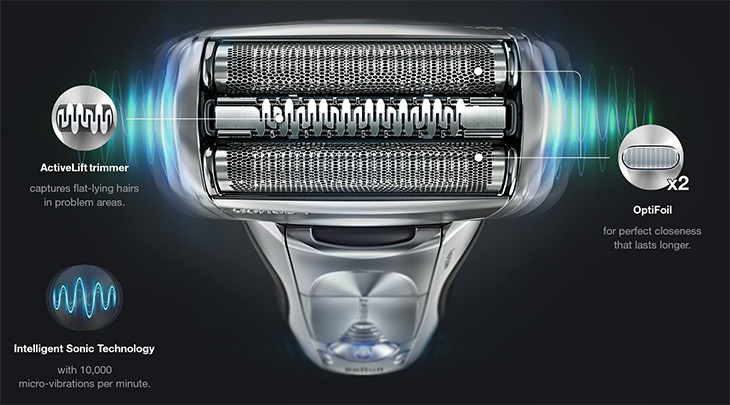 There are two power levels: + and – so that you can choose your shaver speed. Something you may not have seen on any other shaver before is that there is both a battery status indicator and a cleaning indicator at the bottom of the shaver. You can simply flip your shaver over to see these levels on its flat bottom. The colourful indicator system will show you at a glance how much power is left in you shaver. This modern indicator system will also warn you when it’s time for a cleaning and as mentioned before it is enough to place your shaver in the cleaning station when this happens. This shaver is completely waterproof and therefore entirely washable. You can either wash it under the tap or use the cleaning unit for an easy and quick clean. The Braun Series 7 – 790cc has a fully sealed body, so you can bring this shaver in the shower if you wish. No moisture will penetrate the casing to ruin the inner mechanics. However, Braun recommends to shave first thing in the morning before washing your face or taking a shower for the most efficient shave. 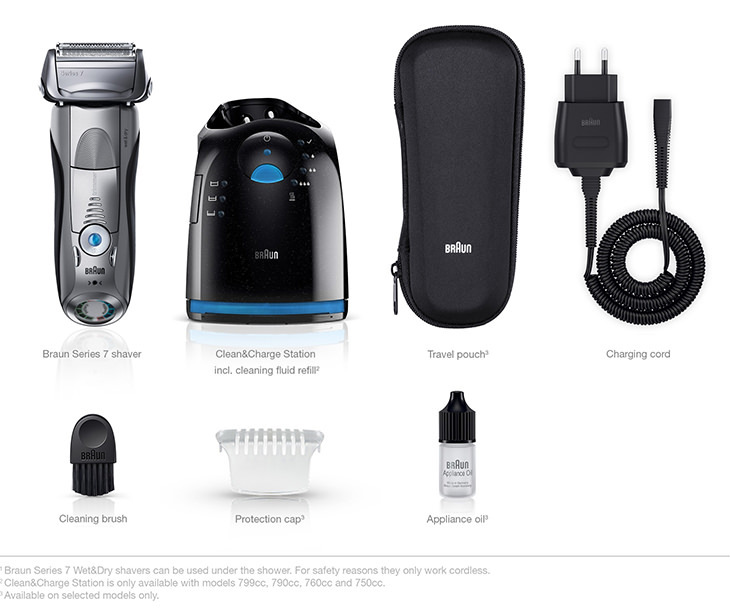 The Braun Series 7 allows you to choose three different settings, so you can customize the shaver to your facial hair. It is also convenient when your beard has different growth lengths. The three personalization modes vary from sensitive to normal, to intensive. The Pulsonic foil shaver is built with a linear motor. 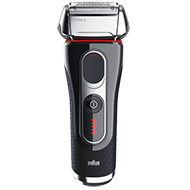 The foil shaving head on the Braun Series 7 features a fully flexible shaving system that moves and adapts to individual facial skin. There are two Optifoils in the shaver. One is on each side of the ActiveLift trimmer, so there are three rows of cutting foils. 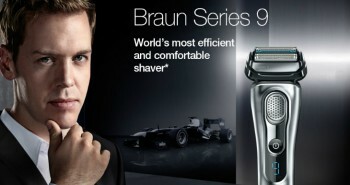 The Braun Optifoil promises the closest shave over other Braun shavers and other brand names. The Optifoil is built with a unique design that’s made to snip off more hair in one go. This design also allows a closer trim to the skin. The head is contour adapting so that it will shave easily over jaw line and down the neck. The two Optifoils are going to be the ones that deliver that final finishing touch to your shaving. The Braun Pulsonic is built with a triple action cutting system. The foil head was developed with three different cutting elements to trim the shortest hair to the longest hair. If the first or second cutting element doesn’t get a hair, the third one will. This way your face will be left completely smooth and soft. 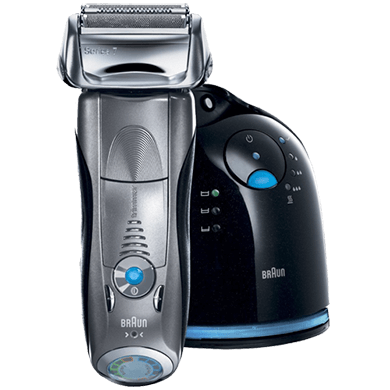 This Braun sh aver is made with intelligent sonic technology, which mean that during shaving, it will automatically increase its power over denser patches of beard. This way you don’t have to push harder at those thicker hairs, you can just hold your shaver comfortably and the sonic technology will take care of everything else. The Pulsonic is built to have 10,000 micro vibrations per minute that will capture hair with each stroke of the unit. Both short and ingrown hairs are easily captured and shaved down by a built-in middle trimmer. This technology is called Activelift, and is the only patented middle trimmer that can grasp flat lying hairs. 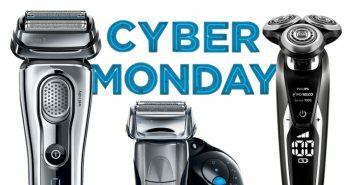 This shaver delivers a thorough shave, decreasing the likelihood that the shaver will need to be repeatedly moved over the same location of skin again and again. Although these micro vibrations are a bit noisy, overall the shaver is not too loud. 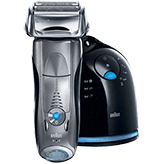 The Braun Series 7 Pulsonic 790cc is designed to provide a comfortable shave and ease discomfort. It also eliminates the tugging of hairs. 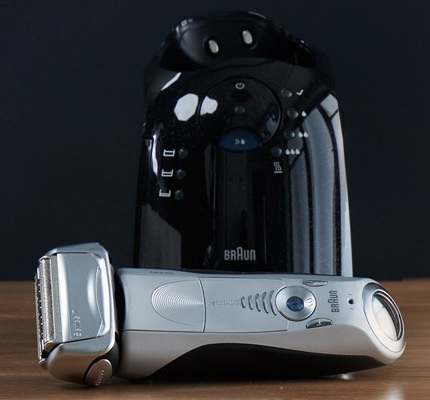 Shaver burn and redness will be at a minimum after shaving with the Braun Pulsonic shaver. The Braun Series 7 – 790 cc has an LCD display that shows you when the battery needs to be recharged as well as the length of the charging and whether it needs to be placed in the cleaning unit. The LCD display on this shaver is the most advanced when compared to the other shavers in the Braun shaver line. What makes this Pulsonic shaver exceptional is the additional cleaning, conditioning, and charging unit. The process is simple. After a morning shave the Pulsonic can be placed in the unit. With a press of a button, the unit will clean the shaver, provide lubrication to keep it in perfect operating condition, and dry it. It will then be charged up and ready for the next shave. The Clean and Renew system requires the use of cleaning cartridges. The cleaning cartridges are made with a clear plastic where you can see the blue cleaning fluid inside. These cartridges have an unusual tooth-shaped design so they can easily be inserted into the cleaning unit. They use an alcohol-based cleaning solution, which removes 99.999% of most germs from the surface of the cutting blades on the shaver. This will prevent future skin infections and irritation. The cleaning solution contains a natural lubricant, which will keep the mechanics of your shaver in its best running order. The cleaning solution has a pleasant fresh lemon scent. There is a Fast Clean option on this unit that makes cleaning fast, particularly if one has forgotten to do it the morning before. This cleanser will also remove those minute stubble hairs that can affect the performance of your shaver. In order to keep your cleaning and charging unit working at optimum performance, you should replace the refill cartridge at least once every three months. These cartridges are sold in packs of three and cost around $20. It’s a small investment in keeping your Braun shaver constantly looking and operating just like a brand new shaver. Additional features on the Braun 790cc include a precision long hair trimmer to trim mustache, sideburns, and beard more accurately. To access this trimmer, there is the word “Trimmer” right on front of the shaver, with some graduated lines. Press up on these and your pop-up trimmer will be exposed. Simply snap into place after you’ve trimmed your hair. The Braun Pulsonic 7 – 790cc is a bit pricier than your average shaver, but it does include the cleaning and charging unit, which can really make a difference in your every day life. In each box you’ll be getting the Braun Series 7 – 790cc shaver, one Clean and Renew charging system, a cleaning brush, one SmartPlug, a Clean and Renew cartridge to get you started, and a protective travel pouch for safe transport. The Braun Series 7 also has a longer lifetime than other shavers and it is equipped with premium features which worth the price. Additional accessories are available for purchase. Replacement foil and cutters are available, as well as Clean and Renew system four pack refills. Clean and Renew cartridges should be changed once every two or three months, or when the unit notifies you that it needs to be done. Cutter parts should be replaced every 18 months, to guarantee the optimum use of your Braun electric shaver. The Braun Series 7 Pulsonic shaver is for men who treat shaving seriously. For those who are looking for a shaver that is comfortable, easy-to-use, easy to maintain and is guranateed to leave a smooth face. These are men who need to look their best for work, and don’t want to have to fight with a finicky shaver. The cleaning and charging unit makes the chore simple. There isn’t any rinsing under the tap and scrubbing with a tiny brush, unless you don’t mind doing so between charging times. You’ll be pleased with at how well the Braun Pulsonic performs. Your purchase of the Braun Series 7- 790cc Pulsonic Shaver System is going to be one of the best products you’ve gotten this year. Your Braun shaver is made with quality, and with the proper performance and upkeep, it will provide you with a great shaving experience for several years ahead. 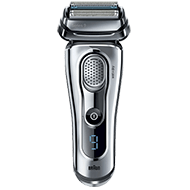 This Braun series 790cc is a great choice over blades. Nonetheless, it won’t solve the problem of hair growing back fast. Comfort and ease of use is what you can expect from Braun 7. Sure, I have checked the charger. You can use it from 100V to 240V. I believe you are wrong. Every source I check says the 5090cc as well as the 790cc are not wet/dry.